Apple officially announced the iPad 3 today at a special media event in San Francisco, ending months of speculation surrounding the specifications of the next-generation tablet. The new iPad features a host of new features and upgrades, highlights of which include a 264 pixels-per-inch (2048 x 1536) 9.7″ retina display, 4G LTE connectivity 5-megapixel camera and a A5X system-on-a-chip with quad-core graphics. The iPad 3’s display offers up double the effective resolution of the iPad 2, with its 264 pixels per inch delivering retina-quality at the optimum viewing distance of 15 inches. The new display also features better color handling, with a 44% improvement in color saturation that will make for more accurate and vivid images. As predicted, the iPad 3 is the first Apple device to be 4G LTE enabled, offering faster download and data transfer speeds than ever before. The LTE iPad 3 will come in two versions in the U.S., one each for Verizon and AT&T with data speed of up to 21 Mbps on HSPA+ and 73 Mbps on LTE. Both models will support 3G roaming worldwide, and also have the capability to act as wireless hotspots, if carrier supported. The on-board iPad 3 camera has received a substantial upgrade, and now features a 5-megapixel iSight camera with improved optics, auto-exposure, auto-focus, IR filter and support for 1080p HD video recording. 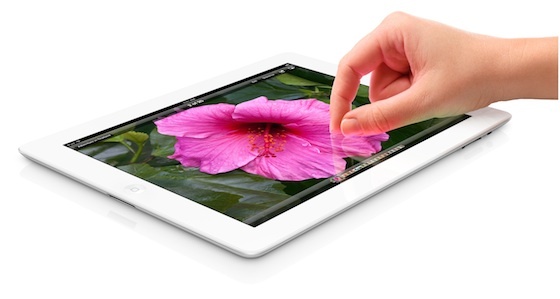 The iPad 3 is slightly heavier and slightly thicker than its predecessor, largely on account of the new retina display. The iPad 3 weighs in at 1.4 lbs vs 1.33 lbs for the iPad 2, and is 0.6 mm thicker. According to initial reports, these minor increases in weight and thickness are hardly perceptible to the user. Despite a more power-hungry display and 4G connectivity, battery life has been maintained at 10 hours on Wi-Fi, with 9 hours on 4G. All native iPad 3 apps have been upgraded and optimized for the new high-resolution display, including new versions of iMovie, iPhoto, Keynote, Pages and Numbers. All other 3rd-party apps will be automatically scaled up to meet the new resolution. Developers are also now able to release updates for existing apps to upgrade and optimize for the new iPad. 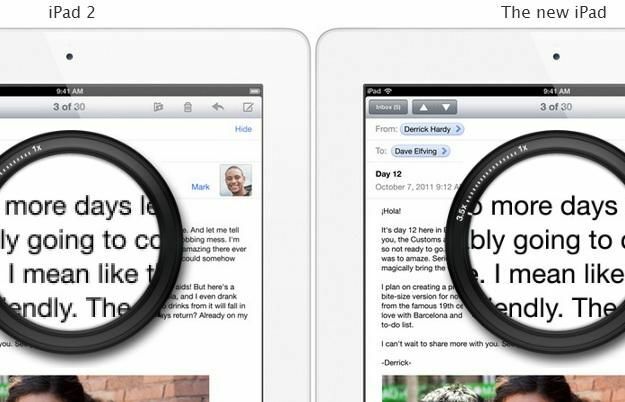 Unexpectedly, Siri compatibility hasn’t been mentioned yet – but the iPad 3 now features voice-dictation software built-in. The iPad 3 will hit stores in the U.S., Canada, Australia, UK, France, Germany, Switzerland, Japan, Hong Kong and Singapore simultaneously on March 16, with other countries to follow thereafter. Pre-orders for the new iPad will start today. 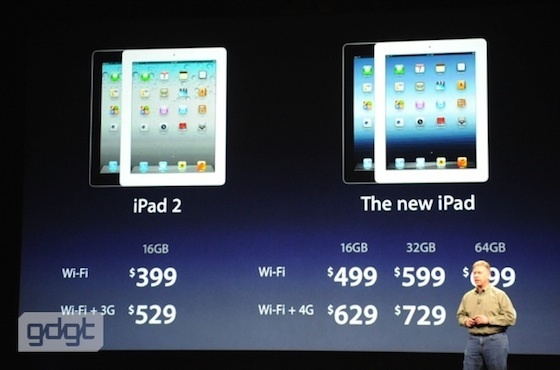 Pricing remains the same as for the iPad 2, with the new iPad costing $499/$599/$499 for the 16GB/32GB/64GB Wi-Fi version and $629/$729/$829 for the 16GB/32GB/64GB 4G LTE model, available in both white and black. Apple will continue to sell the iPad 2 16GB alongside the iPad 3, at the discounted price of $399 (Wi-Fi only) and $529 (Wi-Fi + 3G).